Copyright by Borror Laboratory of Bioacoustics, Department of Evolution, Ecology, and Organismal Biology, Ohio State University, Columbus, OH, all rights reserved. Species has a small population and limited distribution in Montana. CommentApproximately 30 nests have been documented and 54 owls have been banded in Montana between 1994 and 2011 (Owl Research Institute 2011). Thirteen breeding pairs documented in a combination of 2006 and 2007, most on the west side of Glacier National Park. This reasonably puts them in the population category of 50 to 250 individuals. Comment3,851 square kilometers based on Natural Heritage Program range maps that appear on the Montana Field Guide. CommentWhile much remains to be learned of the natural history of the species and their population status is poorly understood due to fluctuations corresponding to prey availability, there is no evidence the species is at risk and populations are likely to have been stable over the past 100 years. There are an estimated 10,000-50,000 pairs in North America. Wetlands in forest habitats are preferred habitat and are probably relatively stable since European arrival. CommentBreeding is regularly reported within the limited area in which the species is found on the west side of Glacier National Park. Populations are probably best regarded as stable over the short-term. ScoreG - Slightly threatened. Threats, while recognizable, are of low severity, or affecting only a small portion of the population or area. CommentFire suppression has likely reduced hunting and prey habitat. Salvage timber harvest that removes potential nest snags represents a threat to the species. Timber harvest practices that provide more edge and more nest and perch trees would benefit the species. Shooting, trapping, vehicle collisions, pesticides, and transmission line electrocutions are probably more minor threats to the species. SeverityLow - Low but nontrivial reduction of species population or reversible degradation or reduction of habitat in area affected, with recovery expected in 10-50 years. CommentAs long as nest snags are retained species should respond to other disturbances quickly and it is likely that suitable nest snags would be retained in or adjacent to wetland habitats. CommentA high percentage of mature conifer forests are threatened by fire and there is some evidence that the species preferentially associates with post-burn forests. ImmediacyModerate - Threat is likely to be operational within 2-5 years. ScoreC - Not Intrinsically Vulnerable. Species matures quickly, reproduces frequently, and/or has high fecundity such that populations recover quickly (< 5 years or 2 generations) from decreases in abundance; or species has high dispersal capability such that extirpated populations soon become reestablished through natural recolonization (unaided by humans). CommentNot Intrinsically Vulnerable. Species matures quickly, reproduces frequently, and/or has a high fecundity such that populations recover quickly (< 5 years or 2 generations) from decreases in abundance. Species has good dispersal capabilities such that extirpated populations generally become reestablished through natural recolonization. ScoreC - Moderate. Generalist. Broad-scale or diverse (general) habitat(s) or other abiotic and/or biotic factors are used or required by the species but some key requirements are scarce in the generalized range of the species within the area of interest. CommentModerate Generalist. Broadly uses boreal conifer forests, usually dominated by spruce and fir, with the key limitation being nest sites and microtine rodent populations which are broadly distributed. The species is also believed to preferentially associate with post-burn forests for nest sites and foraging areas. The Northern Hawk Owl is aptly named, as it more closely resembles an Accipiter hawk species than an owl, both in morphology and behavior. This owl species is often quite visible, typically perching at the tops of trees. In flight, it moves at high speeds close to the ground or flaps its pointed wings using falcon-like strokes (Duncan and Duncan 2014). The Northern Hawk Owl calls persistently during the breeding season. The display call of the male is a trilling, rolling whistling "ululululululul" lasting up to 14 seconds, while the female's advertising call is shorter and less constant in pitch and rhythm, with a hoarser and shriller quality (Duncan and Duncan 2014). In Montana, observations for this species have been recorded every month of the year (Montana Bird Distribution Committee 2012). Nesting records as early as March with fledglings observed May-September (Montana Natural Heritage Program Point Observation Database 2014). The Northern Hawk Owl is easily distinguishable from other species of owls by its long tail, prominent perching habit, and fast, maneuverable flight. The posture of the Northern Hawk Owl is more hawk-like than owl-like. The unique shape of this bird, including its moderately wedge-shaped tail, and overall coloration and appearance make it unlikely to be confused with any hawk species (Sibley 2014). Females are slightly larger than males but can be as much as 17% larger by mass than males (Duncan and Duncan 2014). The back, wings, and head are brownish-black, spotted and streaked with white, while the white breast and belly are heavily and distinctly barred with brown. The head is fairly flat-topped head with a deep v-shaped black and white speckled forehead. The grayish-white facial disc is framed in black. The iris is yellow, the bill is pale yellow to greenish-yellow, and the flesh of the heavily feathered feet is colored a deep slate-gray to black (Duncan and Duncan 2014). Most breeding observations are in and around Glacier National Park (Montana Natural Heritage Program Point Observation Database 2014). Winter distribution covers all but the southeastern portion of Montana but is sporadic irruptive. Movement is sporadic, reflecting irregular movements of individuals in response to prey availability and climatic conditions (Duncan and Duncan 2014). 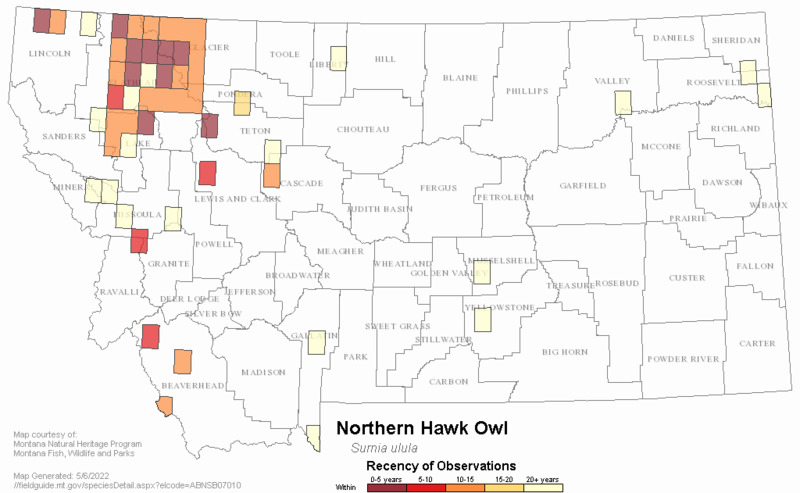 In Montana, birds observed outside of known breeding area from August-February (Montana Natural Heritage Program Point Observation Database 2014). The Northern Hawk Owl breeds in moderately dense coniferous or mixed coniferous-deciduous forests often adjacent to wet meadows and marshes or open areas created by fire or logging (Duncan and Duncan 2014). This species needs suitable perching sites such as snags. Winter habitat similar to breeding habitat but may occur in more open areas depending on prey irruptions (Duncan and Duncan 2014). Studies conducted in other parts of the species' range revealed that the diet of the Northern Hawk Owl is dominated by voles (Duncan and Duncan 2014). The main Microtus species preyed upon in North America include Alaska vole (M. miurus), Meadow Vole (M. pennsylvanicus), Tundra Vole (M. oeconomus), Long-tailed Vole (M. longicaudus), and Yellow-cheeked Vole (M. xanthognathus) (Duncan and Duncan 2014). Other small mammals and bird species that comprise the balance of their diet are numerous and may include shrews, moles, rabbits, hares, squirrels, mice, rats, lemmings, weasels, partridges, doves, woodpeckers, jays, robins, starlings, sparrows, buntings, blackbirds, grackles, and finches (Duncan and Duncan 2014). Hunting may occur during the day or night (Duncan and Duncan 2014). The Northern Hawk Owl watches prey from a perch, strikes with a rapid dive, and returns to an elevated perch to consume the food item. The pellets of this owl species are relatively small (up to 7.5 cm long), gray, and coated in mucus (Nero 1995). Ecological studies have yet to be conducted in the state. However, information from other areas of the species' range shows Northern Hawk Owls tend to occur in the greatest numbers in areas with temporarily high prey populations and may move long distances in response to changes in prey abundance. Population density generally is low (e.g., 4 pairs in 200 square kilometers in Norway; 1 pair per 500 square kilometer in Sweden) (Johnsgard 1988) with a maximum of 3 nests per 100 square kilometers in southwestern Yukon, Canada (Rohner et al. 1995). Home ranges in Europe ranged from 140 to 848 hectares, average 372 hectares (Baekken et al. 1987). In southern Alberta, they establish winter hunting territories (Johnsgard 1992). Limited breeding records exist for Montana. 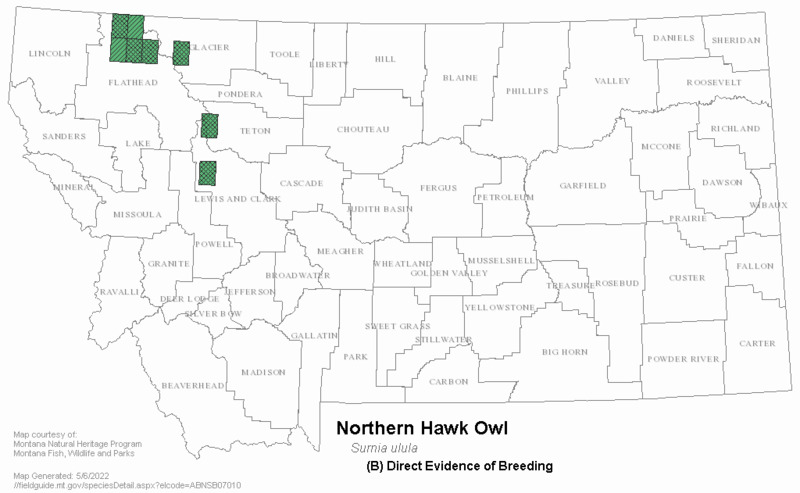 The first record of breeding in the western U.S. occurred in Montana in May of 1990, when a brood of 4 recently fledged young were observed in Polebridge. The first nest was confirmed when one was found in West Glacier in 1994 (eight young, seven fledged), and a second nest was recorded in 1995 when a female was photographed at a cavity site (Wright 1996, Montana Bird Distribution Committee 2012). Reproductive studies of Northern Hawk Owls in other areas of their range have found nesting to be in unlined hollows or cavities. The Northern Hawk Owl produces smooth, slightly glossy eggs that are white, infrequently with a hint of yellow, and are blunt elliptical-oval to elongate-oval in shape (Karalus and Eckert 1974, Baicich and Harrison 2005). Egg-laying has been reported from late April to mid-June in Alaska and arctic Canada; early April to early June in Alberta (Johnsgard 1992, Duncan and Duncan 2014). Clutch size is up to 13 (mean brood size was 6.3 in Fennoscandia, 3.7 in Yukon, 5.5 in Alaska). Incubation, by the female, starts as soon as the first egg is laid and continues until the last egg hatches, in total, about 25 to 30 days. Both parents tend the young, which fledge in 25 to 35 days, but may not be fully independent until they are three months old. Survivorship of the later-hatched young is dependent upon food availability. In Europe, a second brood has been reported with the loss of the first clutch of eggs, but this behavior has not been reported in North America (Baicich and Harrison 2005, Duncan and Duncan 2014). 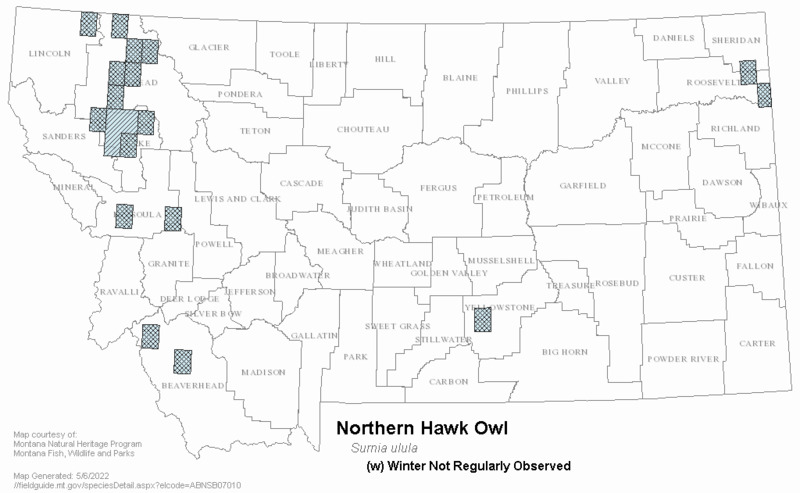 No current management activities in Montana specific to Northern Hawk Owl are documented. Leaving residual trees in clear-cut logging areas can provide habitat for nesting and perching (Duncan and Duncan 2014). Distribution and abundance of prey, particularly in winter, may be the greatest limiting factor to Northern Hawk Owl populations (Duncan and Duncan 2014). Baekken, B. T., J. O. Nybo, and G. A. Sonerud. 1987. 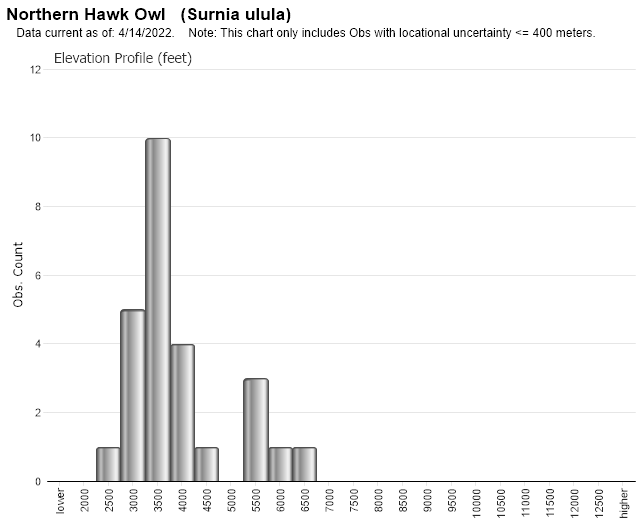 Home range size of hawk owls: dependence on calculation method, number of tracking days, and number of plotted perches. In: Nero, R.W., R. J. Clark, R. J. Knapton, and H. Hamre, eds. pp. 145-148. Biology and conservation of northern forest owls. USDA Forest Service General Technical Report RM-142, USDA Forest Service, Rocky Mountain Forest and Range Experiment Station, Fort Collins, Colorado. Baicich, P.J. and C.J.O. Harrison. 2005. A guide to the nests, eggs and nestlings of North American birds. Second edition. Academic Press, New York. Earhart, C. M. and N. K. Johnson. 1970. Size dimorphism and food habits of North American owls. Condor 72:251-264. Johnsgard, P. 1988. North American owls: biology and natural history. Smithsonian Institution Press. 336 pp. Karalus, K.E. and A.W. Eckert. 1974. The owls of North America (north of Mexico). Doubleday, Garden City, N.Y. 278 pp. McGillivray, W. B. 1987. Reversed sexual dimorphism in 10 species of northern owls. In: Nero, Robert W.; Clark, Richard J.; Knapton, Richard J.; Hamre, R. H., eds. Pp. 59-66. Biology and conservation of northern forest owls: symposium proceedings; 1987 February 3-7; Winnipeg, MB. General Technical Report RM-142. U.S. Department of Agriculture, Forest Service, Rocky Mountain Forest and Range Experiment Station. Fort Collins, CO.
Mueller, H.C. 1986. The evolution of reversed sexual dimorphism in owls: an empirical analysis of possible selective factors. Wilson Bulletin 98:387-406. Nero, R. W. 1995. Notes on a wintering northern hawk owl in Manitoba. Blue Jay 53:205-214. Rohner, C., J. N. M. Smith, J. Stroman, M. Joyce, F. I. Doyle, and R. Boonstra. 1995. Northern hawk-owls in the nearctic boreal forest: prey selection and population consequences of multiple prey cycles. Condor 97:208-220. Austen M.J. W., M.D. Cadman, and R.D. James. 1994. Ontario birds at risk: status and conservation needs. Federation of Ontario Naturalists and Long Point Bird Obs., Port Rowan, Ontario, Canada. Bent, A.C. 1938. Life histories of North American birds of prey. Part 2. U.S. Nat. Mus. Bull. 170. 482 pp., 92 pls. Clark, R.J., D.G. Smith, and L. Kelso. 1987. Distributional status and literature of northern forest owls. Pp. 47-55 in Nero R.W., R.J. Clark, R.J. Knapton, and R.H. Hamre (eds. ), Biology and conservation of northern forest owls: symposium proceedings, Feb. 3-7, Winnepeg, Manitoba. Gen. Tech. Rep. RM-142. USDA, Forest Service:, Rocky Mountain Forest and Range Experiment Station, Fort Collins, CO. 309 pp. 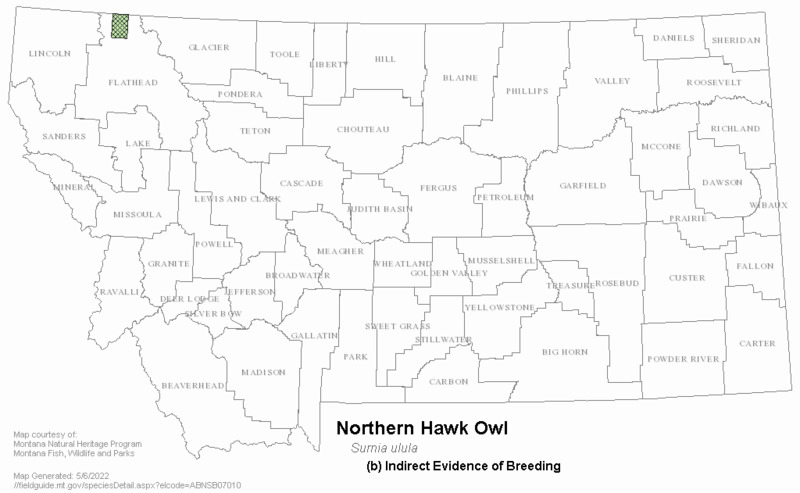 Montana Bird Distribution Online Database. 2001. Helena, Montana, USA. April-September 2003. Owl Research Institute. 2010. 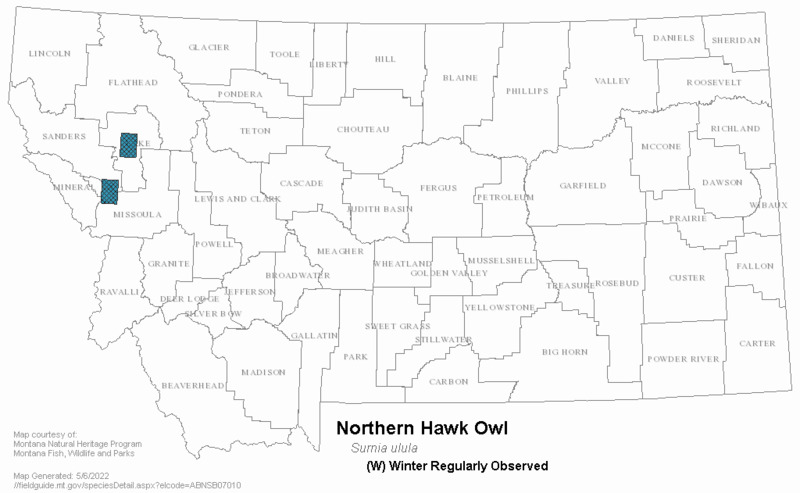 2010 Northern Hawk Owl breeding survey report for Flathead National Forest with additional observations from Glacier National Park. Owl Research Institute. Charlo, MT. 8pp. Sibley, D.A. 2000. The Sibley guide to birds. National Audubon Society and Alfred A. Knopf, Inc., New York, NY. 544 pp. Skaar, P.D. (1923-1983). Notes in the unpublished P.D. Skaar files; notebook 2 of 2. Housed at Montana Audubon, Helena, Montana. Terres, J.K. 1980. The Audubon Society encyclopedia of North American birds. Alfred A. Knopf, New York. 1109 pp. 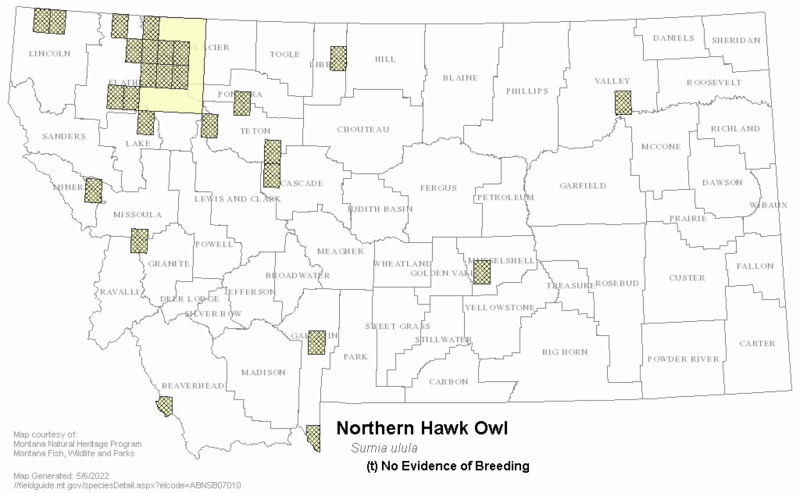 Web Search Engines for Articles on "Northern Hawk Owl"